Compsognathus (/kɒmpˈsɒɡnəθəs/; Greek kompsos/κομψός; "elegant", "refined" or "dainty", and gnathos/γνάθος; "jaw") is a genus of small, bipedal, carnivorous theropod dinosaurs. Members of its single species Compsognathus longipes could grow to the size of a turkey. They lived about 150 million years ago, the Tithonian age of the late Jurassic period, in what is now Europe. Paleontologists have found two well-preserved fossils, one in Germany in the 1850s and the second in France more than a century later. Today, C. longipes is the only recognized species, although the larger specimen discovered in France in the 1970s was once thought to belong to a separate species and named C. corallestris. 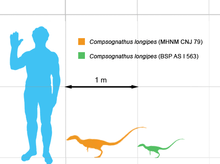 Many presentations still describe Compsognathus as "chicken-sized" dinosaurs because of the small size of the German specimen, which is now believed to be a juvenile. Compsognathus longipes is one of the few dinosaur species for which diet is known with certainty: the remains of small, agile lizards are preserved in the bellies of both specimens. Teeth discovered in Portugal may be further fossil remains of the genus. Although not recognized as such at the time of its discovery, Compsognathus is the first theropod dinosaur known from a reasonably complete fossil skeleton. 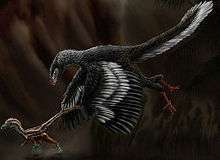 Until the 1990s, it was the smallest known non-avialan dinosaur; earlier it was incorrectly thought to be the closest relative of Archaeopteryx. Compsognathus were small, bipedal animals with long hind legs and longer tails, which they used for balance during locomotion. The forelimbs were smaller than the hindlimbs and featured three digits equipped with solid claws suited for grasping prey. Their delicate skulls were narrow and long, with tapered snouts. The skull had five pairs of fenestrae (skull openings), the largest of which was for the orbit (eye socket). The eyes were large in proportion to the rest of the skull. The remains of a lizard in the German specimen's thoracic cavity show that Compsognathus preyed on small vertebrates. Marsh, who examined the specimen in 1881, thought that this small skeleton in the Compsognathus belly was an embryo, but in 1903, Franz Nopcsa concluded that it was a lizard. Ostrom identified the remains as belonging to a lizard of the genus Bavarisaurus, which he concluded was a fast and agile runner owing to its long tail and limb proportions. This in turn led to the conclusion that its predators, Compsognathus, must have had sharp vision and the ability to rapidly accelerate and outrun the lizard. The Bavarisaurus is in a single piece, indicating that the Compsognathus must have swallowed its prey whole. The French specimen's gastric contents consist of unidentified lizards or sphenodontids. Children's dinosaur books commonly feature Compsognathus. For a long time they were unique in their small size, as most other small dinosaurs were discovered and described a century or more later. These animals have appeared in the movies The Lost World: Jurassic Park and Jurassic Park III. In The Lost World: Jurassic Park, one of the characters incorrectly identifies the species as "Compsognathus triassicus", combining the genus name of Compsognathus longipes with the specific name of Procompsognathus triassicus, a distantly related small carnivore featured in the Jurassic Park novels. ↑ Liddell, Henry George; Scott, Robert (1980) . A Greek-English Lexicon (abridged ed.). Oxford, United Kingdom: Oxford University Press. ISBN 0-19-910207-4. ↑ Seebacher, F. (2001). "A new method to calculate allometric length-mass relationships of dinosaurs". Journal of Vertebrate Paleontology. 21 (1): 51–60. doi:10.1671/0272-4634(2001)021[0051:ANMTCA]2.0.CO;2. 1 2 Lambert, David (1993). The Ultimate Dinosaur Book. New York: Dorling Kindersley. pp. 38–81. ISBN 1-56458-304-X. 1 2 3 4 Chen, P.; Dong, Z.; Zhen, S. (1998). "An exceptionally well-preserved theropod dinosaur from the Yixian Formation of China". Nature. 391 (6663): 147–152. Bibcode:1998Natur.391..147C. doi:10.1038/34356. 1 2 3 4 Reisdorf, A.G.; Wuttke, M. (2012). "Re-evaluating Moodie's Opisthotonic-Posture Hypothesis in fossil vertebrates. Part I: Reptiles - The taphonomy of the bipedal dinosaurs Compsognathus longipes and Juravenator starki from the Solnhofen Archipelago (Jurassic, Germany)". Palaeobiodiversity and Palaeoenvironments. 92 (1): 119–168. doi:10.1007/s12549-011-0068-y. 1 2 3 4 5 Ostrom, J.H. (1978). 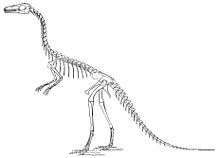 "The osteology of Compsognathus longipes". Zitteliana. 4: 73–118. ↑ Gauthier, J.; Gishlick A.D. (2000). "Re-examination of the manus of Compsognathus and its relevance to the original morphology of the Coelurosaur manus". Journal of Vertebrate Paleontology. 20 (3, Supplement): 43A. doi:10.1080/02724634.2000.10010765. 1 2 Bidar, A.; Demay L.; Thomel G. (1972). "Compsognathus corallestris, une nouvelle espèce de dinosaurien théropode du Portlandien de Canjuers (Sud-Est de la France)". Annales du Muséum d'Histoire Naturelle de Nice. 1: 9–40. 1 2 3 4 5 Peyer, K. (2006). "A Reconsideration Of Compsognathus From The Upper Tithonian Of Canjuers, Southeastern France". Journal of Vertebrate Paleontology. 26 (4): 879–896. doi:10.1671/0272-4634(2006)26[879:AROCFT]2.0.CO;2. 1 2 Currie, P.J. ; P. Chen (2001). "Anatomy of Sinosauropteryx prima from Liaoning, northeastern China". Canadian Journal of Earth Sciences. 38 (12): 1705–1727. Bibcode:2001CaJES..38.1705C. doi:10.1139/cjes-38-12-1705. ↑ Ji, S.; Ji, Q.; Lu, J.; Yuan, C. (2007). "A new giant compsognathid dinosaur with long filamentous integuments from Lower Cretaceous of Northeastern China". Acta Geologica Sinica. 81 (1): 8–15. ↑ Peyer, K. (2006). "A reconsideration of Compsognathus from the Upper Tithonian of Canjuers, southeastern France". Journal of Vertebrate Paleontology. 26 (4): 879–896. doi:10.1671/0272-4634(2006)26[879:AROCFT]2.0.CO;2. ↑ von Huene, F. (1901). "Der vermuthliche Hautpanzer des "Compsognathus longipes" Wagner". Neues Jahrbuch für Mineralogie, Geologie and Palaeontologie. 1: 157–160. ↑ Xu, Xing (2006). "Palaeontology: Scales, feathers and dinosaurs". Nature. 440 (7082): 287–8. Bibcode:2006Natur.440..287X. doi:10.1038/440287a. PMID 16541058. ↑ Paul, Gregory S. (1988). "Early Avetheropods". Predatory Dinosaurs of the World. New York: Simon & Schuster. pp. 297–300. ISBN 0-671-61946-2. 1 2 Wellnhofer, P. (2008). "Dinosaurier". Archaeopteryx — der Urvogel von Solnhofen. Munich: Verlag Dr. Friedrich Pfeil. p. 256. ISBN 978-3-89937-076-8. ↑ Wagner, J. A. (1859). "Über einige im lithographischen Schiefer neu aufgefundene Schildkröten und Saurier". Gelehrte Anzeigen der Bayerischen Akademie der Wissenschaften. 49: 553. ↑ Wagner, Johann Andreas (1861). "Neue Beiträge zur Kenntnis der urweltlichen Fauna des lithographischen Schiefers; V. Compsognathus longipes Wagner". Abhandlungen der Bayerischen Akademie der Wissenschaften. 9: 30–38. ↑ Gegenbaur, Karl (1863). "Vergleichend-anatomische Bemerkungen über das Fußskelet der Vögel". Archiv für Anatomie, Physiologie und Wissenschaftliche Medicin. 1863: 450–472. ↑ Cope, Edward Drinker (1867). "An account of the extinct reptiles which approached the birds". Proceedings of the Academy of Natural Sciences of Philadelphia. 19: 234–235. ↑ Huxley, T.H. (1868). "On the animals which are most nearly intermediate between birds and reptiles". Annals and Magazine of Natural History. 2: 66–75. ↑ Marsh, Othniel Charles (1896). "Classification of dinosaurs". Geological Magazine. 3 (9): 388–400. doi:10.1017/S0016756800131826. 1 2 Michard, J. G. (1991). "Description du Compsognathus (Saurischia, Theropoda) de Canjuers (Jurassique supérieur du Sud-est de la France), position phylogénétique, relation avec Archaeopteryx et implications sur l'origine théropodienne des oiseaux,". Ph.D. dissertation, Muséum National d'Histoire Naturelle, Paris. ↑ Callison, G.; H. M. Quimby (1984). "Tiny dinosaurs: Are they fully grown?". Journal of Vertebrate Paleontology. 3 (4): 200–209. doi:10.1080/02724634.1984.10011975. ↑ Zinke, J. (1998). "Small theropod teeth from the Upper Jurassic coal mine of Guimarota (Portugal)". Palaontologische Zeitschrift. 72: 179–189. doi:10.1007/bf02987825. ↑ Seeley, H.G. (1887). "On Aristosuchus pusillus (Owen), being further notes on the fossils described by Sir. R. Owen as Poikilopleuron pusillus, Owen". Quarterly Journal of the Geological Society of London. 43: 221–228. doi:10.1144/GSL.JGS.1887.043.01-04.22. ↑ Hwang, S.H. ; Norell, M. A.; Qiang, J.; Keqin, G. (2004). "A large compsognathid from the Early Cretaceous Yixian Formation of China". Journal of Systematic Paleontology. 2: 13–39. doi:10.1017/S1477201903001081. ↑ Naish, D.; Martill, D. M.; Frey, E. (2004). "Ecology, systematics and biogeographical relationships of dinosaurs, including a new theropod, from the Santana Formation (?Albian, Early Cretaceous) of Brazil". Historical Biology. 16 (2–4): 1–14. doi:10.1080/08912960410001674200. ↑ Ji, Q.; Ji S.A. (1996). 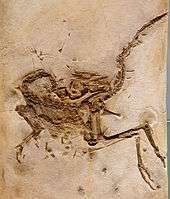 "On discovery of the earliest bird fossil in China and the origin of birds (in Chinese)". Chinese Geology. 233: 30–33. ↑ Göhlich, U.; L. M Chiappe (2006). "A new carnivorous dinosaur from the Late Jurassic Solnhofen archipelago". Nature. 440 (7082): 329–332. Bibcode:2006Natur.440..329G. doi:10.1038/nature04579. PMID 16541071. ↑ Dal Sasso, C.; M. Signore (1998). "Exceptional soft-tissue preservation in a theropod dinosaur from Italy". Nature. 392 (6674): 383–387. Bibcode:1998Natur.392..383D. doi:10.1038/32884. ↑ Holtz TR, Molnar RE, Currie PJ (2004). "Basal Tetanurae". In Weishampel DB, Osmólska H, Dodson P. The Dinosauria (2nd Edition). University of California Press. p. 105. ISBN 0-520-24209-2. ↑ Gauthier, J.A. (1986). "Saurischian monophyly and the origin of birds". In Padian, K. (ed.) the Origin of Birds and the Evolution of Flight, Memoirs of the California Academy of Sciences. 8: 1–55. ↑ Forster, C.A. ; Sampson, S.D. ; Chiappe, L.M. ; Krause, D.W. (1998). "The theropod ancestry of birds: new evidence from the Late Cretaceous of Madagascar". Science. 279 (5358): 1915–1919. Bibcode:1998Sci...279.1915F. doi:10.1126/science.279.5358.1915. PMID 9506938. ↑ Fastovsky DE, Weishampel DB (2005). "Theropoda I:Nature red in tooth and claw". In Fastovsky DE, Weishampel DB. The Evolution and Extinction of the Dinosaurs (2nd Edition). Cambridge University Press. pp. 265–299. ISBN 0-521-81172-4. 1 2 Weishampel, D.B., Dodson, P., Oslmolska, H. (2004). The Dinosauria (Second ed.). University of California Press. ↑ Senter, P.; Kirkland, J. I.; Deblieux, D. D.; Madsen, S.; Toth, N. (2012). Dodson, Peter, ed. "New Dromaeosaurids (Dinosauria: Theropoda) from the Lower Cretaceous of Utah, and the Evolution of the Dromaeosaurid Tail". PLoS ONE. 7 (5): e36790. Bibcode:2012PLoSO...736790S. doi:10.1371/journal.pone.0036790. PMC 3352940 . PMID 22615813. ↑ Nopcsa, Baron F. (1903). "Neues ueber Compsognathus". Neues Jahrbuch fur Mineralogie, Geologie und Palaeontologie (Stuttgart). 16: 476–494. ↑ Evans, S.E. (1994). "The Solnhofen (Jurassic: Tithonian) lizard genus Bavarisaurus: new skull material and a reinterpretation". Neues Jahrbuch für Paläontologie und Geologie, Abhandlungen. 192: 37–52. ↑ Barthel, K.W. (1964). "Zur Entstehung der Solnhofener Plattenkalke (unteres Untertithon)". Mitteilungen der Bayerischen Staatssammlung für Paläontologie und historische Geologie. 4: 7–69. ↑ Viohl G (1985). "Geology of the Solnhofen lithographic limestone and the habitat of Archaeopteryx". In Hecht MK, Ostrom JH, Viohl G, Wellnhofer P. The Beginnings of Birds: Proceedings of the International Archaeopteryx Conference. Eichstätt: Freunde des Jura-Museums. pp. 31–44. OCLC 13213820. ↑ Wilson, Ron (1986). 100 Dinosaurs from A to Z. New York: Grosset & Dunlap. p. 18. ISBN 0-448-18992-5. ↑ Attmore, Stephen (1988). Dinosaurs. Newmarket, England: Brimax Books. p. 18. ISBN 0-86112-460-X. ↑ Berry, Mark F. (2002). The dinosaur filmography. Jefferson, North Carolina: McFarland. p. 273. ISBN 0-7864-1028-0.